The Birmingham Canoe Club, Inc. (BCC) is an active canoe and kayak club with over 150 family memberships. 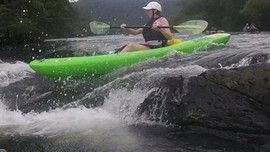 We are based in Birmingham, Alabama where we have access to excellent spots to paddle like Locust Fork, Mulberry Fork, The Cahaba, & the Coosa rivers. The Birmingham Canoe Club, Inc. is a non-profit organization dedicated to the advancement and enjoyment of canoeing, kayaking, and all paddle sports. The club is committed to conserving waterways and to promote access to those waterways for all. The BCC was formed in October 1971 and incorporated on December 4, 1980. We hold General Membership Meetings at various locations each month, typically on the first Tuesday of the month. Locations, dates and times will be posted to the website and facebook group as details are set. Information will also be distributed to the members via e-mail newsletters. Membership in the club is $20 for an individual or family living in the same household with one email address. Membership is paid annually and expires on Dec. 31 every year.